Many people struggle with effectively communicating their needs and desires in relationships because they lack healthy boundaries and struggle with guilt. Often, people speak their mind but feel guilty. Other times people avoid the feeling of guilt but do so by putting their needs aside. Unfortunately, neither of these are healthy choices. The healthiest choice is to communicate needs and desires directly with the understanding that doing so is an exercise in self-care and care of the relationship. Guilt is an unwelcome deceiver.When we say “yes” to something we don’t want to do, we usually do so for one of two reasons. 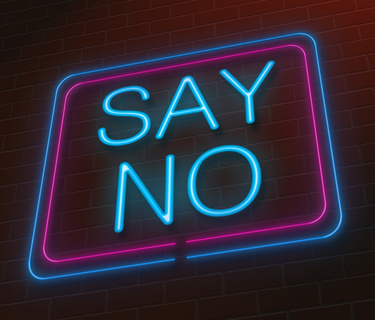 The first reason we fail to set boundaries in the form of saying “no” is wanting to avoid something that feels uncomfortable or negative. Perhaps we want to avoid an argument, a disagreement or don’t want to see the person we care about become disappointed. This is where guilt plays a part for many. If we say “no” to something and that boundary results in our partner becoming sad, disappointed or upset, many people blame themselves and thereby feel guilt. So, to avoid feelings of guilt, people begin saying “yes” to things they don’t want to do because they feel it’s the only good choice. They unknowingly “victimize” themselves believing they are responsible for another person’s disappointment, frustration or anger. This sets them up to hide their own thoughts and feelings as they believe it’s necessary to prevent a disagreement or prevent their partner from becoming upset. The end result? Resentment and lack of intimacy. When it becomes a habitual way of relating, it’s called codependency. Resentment grows because the person feels they “had to say yes” to avoid a negative interaction, guilt or discomfort. They are in essence saying they don’t have a choice and they take the stance of a victim. In the beginning, resentment is usually not present, but as this behavior continues, the person ignoring their own needs becomes increasingly resentful. They don’t realize they are responsible for their own resentment and are also responsible for saying “yes” to many things they didn’t want. They usually just don’t like the other option which requires dealing with the resulting feelings and reactions from the other person when a boundary is set and dealing with their own discomfort in the process. Intimacy is reduced when a person avoids disclosing their true feelings and desires because the other person no longer has an opportunity to understand their partner. If a person continues to agree to things they don’t want to do, the other partner has no understanding of their preferences and needs. They miss the opportunity to learn about their partner. This, in turn, creates a gap in intimacy because there is a gap in understanding. In reality, disagreements can be healthy because they work out and bring about greater knowledge and intimacy between two people. Disagreement in itself is never harmful, it’s how the disagreement is expressed. The second reason we say “yes” to something we don’t want to do is because we wish to temporarily put aside our needs for the well-being of someone we care about. And this is healthy. It’s not done out of perceived obligation, but from wanting to care for someone and not doing so at significant expense of ourselves. It’s knowing there is the option to say “no”, but choosing to say “yes” because we want to care for someone we care about. This choice doesn’t foster resentment because we willingly put our needs aside temporarily for another. It doesn’t break down intimacy because these situations usually involve minor issues and don’t impede significant understanding between two people. For example, if a good friend asks you to go to Chinese food and you don’t feel like eating it that night but you really want your friend to enjoy dinner, you would simply agree to go eat Chinese that evening. Saying “no” and setting boundaries is an important part of a relationship and crucial for intimacy and understanding. And, the outline above hopefully helps delineate when it’s healthy to let your needs go unheard and when it’s important to speak up. Saying “no” to a request that otherwise would build resentment or decrease understanding of each other is very important. It’s important so intimacy and understanding can build. It helps two people know how compatible they are, what they have in common and helps facilitate trust because one person never has to guess if the other is just “going along with something”. Both parties are taking care of themselves and simultaneously taking care of the relationship. So, the next time you’re about to go along with something your gut says isn’t right for you, try and remind yourself the importance of dealing with the discomfort of setting boundaries and the importance of being transparent in the relationship to help strengthen and give it a solid foundation from which to build.